It’s a familiar sight to see a parking lot of full of focused racers on stationary trainers warming up before their race begins. Depending on your pre-race ritual, you may be one of these racers, or you may opt for a bit of light stretching and a cup of coffee before you begin. Either way, the importance of a good pre-race warm-up can’t be overstated. Regardless of your ability level or discipline, preparing your body for the day’s effort is critical to ensure that you’re able to get the most out of your performance. Your body is a complex machine, and understanding how it reacts to race paced efforts, and how to best prepare it for those efforts will keep you feeling fit and fast once the gun goes off. Knowing how your body reacts when you begin to race will help you better understand what you need to do to properly prepare for the effort. When your body is placed under stress, such as the beginning of a race, it can cause a process called glycolysis to begin. Glycolysis is the breakdown of stored muscle glycogen to produce ATP (energy)1. This process results in the formation of both lactic acid and hydrogen. Both of these byproducts increase the acidity in your muscles and begin a process known as the bicarbonate buffer. During this process, your body buffers the acid produced and converts it into water and carbon dioxide. When the conversion to water and carbon dioxide takes place, your body is able to eliminate these two products via expiration through your lungs2. On a cellular level, the accumulation of lactate, along with other metabolites such as inorganic phosphates, also occurs. Muscle fatigue is caused in part due to the inability of cells to maintain the rate and force of contraction via the loss of potassium from inside the muscle cells. Your body looks for energy from different sources in an effort to sustain the stress it’s being put through. Some of that energy comes from carbohydrates while nearly 1/3 of the energy comes from lactate itself. The rest of the fuel needed comes from circulating blood glucose and stored muscle glycogen3. Of course this is a simplified version of all of the complex systems at work during intense aerobic activity. However, it helps to provide some insight into what systems and processes need to be primed before beginning a race. When you begin a race without a proper warm up you’re forcing all of these systems to play catch up, and that can be very detrimental to your performance. The primary objective of any warm up is to effectively prepare your body for the rigors of the race that’s about to begin. A warm body is one that’s ready for the effort, and less likely to get injured. As described above, your body is undergoing complex metabolic processes, and the goal of a good warm-up is to jump start your metabolic engine. When you raise your heart rate and increase blood flow to your muscles you’re not only literally warming up your body. You are also warming up on a cellular level, delivering more oxygen to help metabolize lactic acid. With increased oxygen delivery to the muscles, your body will be able to more quickly buffer acid build up in the muscles when you begin a race at an all out, or intense effort. This effectively means that you’ll spend less time anaerobic because your body will have the ability to more quickly deliver glycogen to struggling muscles. Not all lactic acid is bad. Just as important as your muscular function is your mental cognition. With increased aerobic activity comes the production of lactic acid. Some of this lactic acid is sent to the liver and converted to glucose where it’s then delivered to the brain. During exercise, your brain needs a steady and consistent supply of glucose to remain sharp. A proper warm-up begins the production of glucose and starts supplying your brain with the proper amount before the beginning of the race4. This not only helps your performance, but also helps your focus and preparedness before you take off. For shorter races such as time trials, criteriums, or short track mountain bike races, a more structured and intense warm-up is recommended. When asking your body to respond to a high stress situation as soon as the race begins, you’ll want to ensure your body is ready to produce the desired effort. One of the goals should be to end your warm-up as close to the beginning of the race as possible in order to arrive at the start with an elevated heart rate5. The duration and intensity of the warm-up will depend on the projected demands of the race itself. However, setting aside 30 to 45 minutes and including several efforts at or above threshold should produce the desired outcome. Take time to ease into your warm-up by gradually ramping up the effort during the first 10 to 15 minutes. Part of a good warm-up is having the time to perform a mental check and prepare both your body and your mind. Here is an example warm-up: Total ride time is 35 minutes. Ride for 10 minutes building towards 80 percent of your threshold during the last 3 minutes. Back off for 3 minutes before starting the main effort. Main Effort: 3×1 minute at 85 percent. 3×30 seconds at 95 percent. 3×15 seconds at 100 105 percent. Take 30 seconds of recovery in zone 2 between each interval. Finish the warm-up at 75 percent. While your body will have more time to respond to the demands of the race during longer events, a dedicated warm-up is still just as important, although it may not need to be as structured. 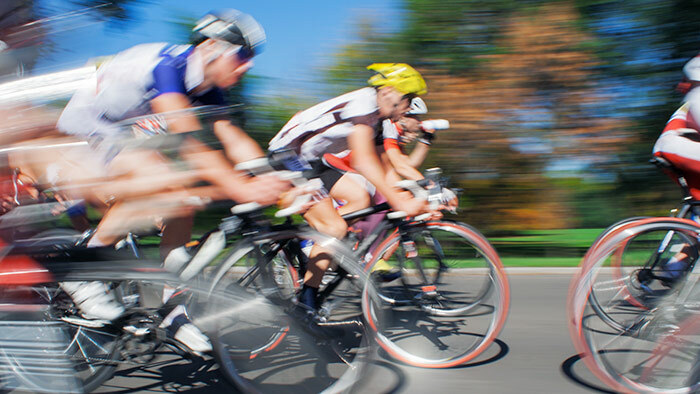 Events like long road or mountain bike races tend to allow you more time to ease into the day’s effort. You can adapt your warm-up accordingly if your event begins with a neutral roll out, or long gradual climb. Including a few sustained sub-threshold efforts prior to the start will help to prime your body for a long day in the saddle. Remember, the goal is not to wear yourself out but rather to prepare you for what’s to come. A warm-up lasting 20 to 30 minutes should allow you enough time to start the necessary processes in the body, without tiring you out. Here is an example warm-up: Total ride time is 25 minutes. Spin easy for 10 minutes increasing your cadence and building to 75 percent in the last 2 minutes. Then perform 2×5 minutes at 85 to 90 percent. Recover for 3 minutes in zone 2 between each interval. Ride the last few minutes tapering down to 70 percent. Race day efforts are intense and ask a lot of your body’s systems. It’s vital that your body and mind are properly prepared for what you’re asking of it. A proper warm-up is one of the best ways to ensure that all of your hours of training leading up to the event are not wasted. While the chemical and cellular processes are complex, your warm-up doesn’t have to be. Understanding what your body undergoes will allow you to adapt your routine to the demands of the race. Carve out a small amount of time before the start and show up to the line warm and ready to deliver a podium topping effort.